Timber for use in load bearing situations is typically required to be graded to strength classes usually C16, C24 and TR26 in the UK (TR26 and C24 are a higher structure grade than C16). Graded timber is generally kiln dried (moisture content is reduced to required levels in a kiln), although can also be wet graded (which is moisture content at ambient levels and not kiln dried). It is increasingly being specified as regularised which means that the product has a machined finish, giving a regular consistent section size.C16 and C24 are the most common Strength Class used in the UK, and it is normally specified by architects or builders for domestic floor joists or the studs in timber-framed walls. 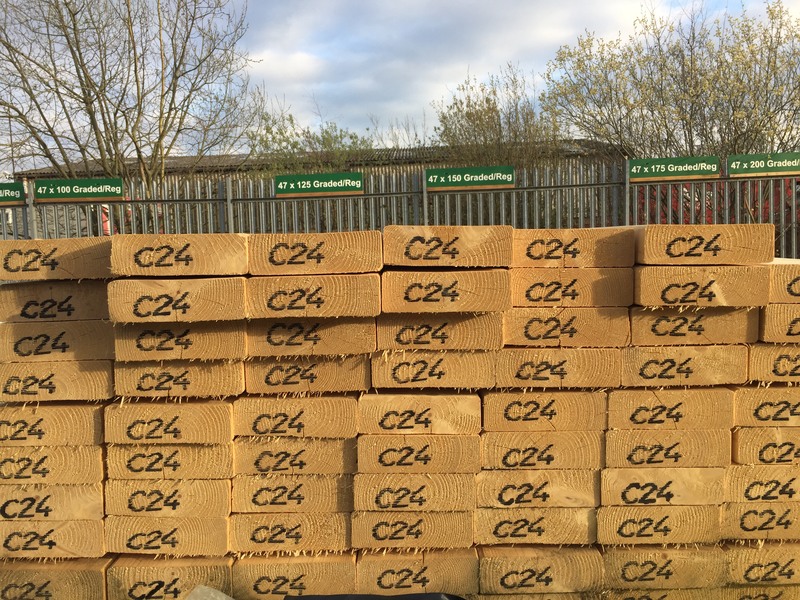 We stock a range of C16/C24 mix graded and regularised timbers at both our depots. If you have any specific requirements then please contact our sales team on 01472 350151.